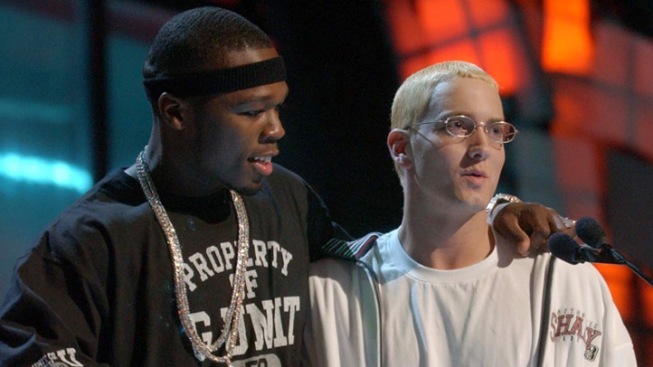 It's been nearly 10 years since 50 Cent and Eminem collaborated on "Get Rich or Die Tryin"' --- seen here onstage during the 2003 MTV Video Music Awards. The rumors were true: Eminem joined 50 Cent to recreate "Get Rich or Die Tryin"' Friday night at South By Southwest. It was a throwback to the heyday of gangster rap at the music conference and festival as 50 Cent hit the stage at the Shady Records showcase in a camouflage bullet-proof vest and a Yankees cap as clouds of chronic floated through the air. With a seven-piece band and MC Tony Yayo at this side, he laid down the 16 game-changing tracks from "Get Rich," performing the entire album live for the first time. "It's been a minute," he told the crowd of about 2,000 at the Austin Music Hall and an audience watching via Fuse and YouTube. "It's been 10 years. That album sold 13 million copies. Damn." The album came out in February 2003, with Eminem and Dr. Dre serving as executive producers and featured rappers. While Dr. Dre didn't show in Austin, Eminem -- the focus of rumors all week -- joined 50 on "Patiently Waiting" and a short encore that almost didn't come off because of lackluster crowd reaction, a commonplace occurrence at SXSW. "I guess it's not what have I done, but what have I done for you lately, is that right?" a tweaked 50 Cent said when he returned to the stage. But perhaps showing he's mellowed in the decade since he filled the air with the "pop pop pop" of songs like "In Da Club" and "Many Men (Wish Death)," he did the encore anyway. Dre wasn't the only prominent player missing from the session. Governor replaced the late Nate Dogg, who passed away a year ago this week, on "21 Questions." Fit and on his game, 50 seemed in high spirits throughout the show and marveled at how, against the odds, he did get rich and didn't die tryin'. "The money came so fast, I couldn't (expletive) it up," the 36-year-old said. "I was trying everything I could think of."